Since I frequently hear the same three questions about QuickBooks Desktop at the start of every new year, I thought I’d share these most-asked QuickBooks year end questions (and answers) with you! 1. 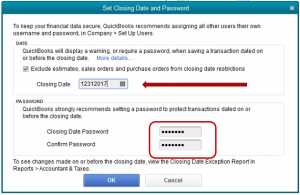 How do I close the year in my QuickBooks file? Answer: You don’t! 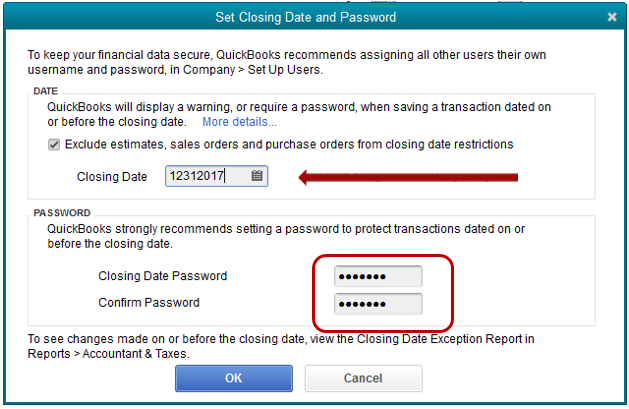 QuickBooks company files do not require or support a year-end close process. 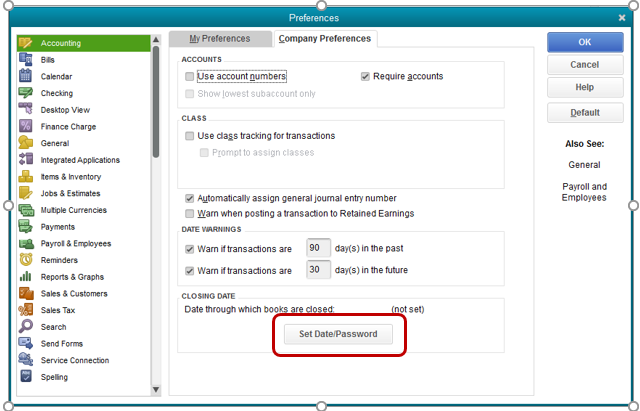 However, it is suggested that after reconciling the books you enter a “Closing Date” which will prevent you from modifying the previous year transactions unless you enter the Closing Date password. This Closing Date does not remove transactions, it just prevents them from being edited. This feature protects the integrity of the prior period books and records. In future years, just update the Closing Date. The system keeps the last Closing Date entered. Some accountants set a Closing Date each month after issuing financial statements. Accountants can also set a Closing Date before returning an “Accountant’s Copy” changes. When I set the Closing Date for a client, I use my phone number as the password. This way the client can call and discuss any changes they want to make in the file and we can determine if the changes will require an amended financial statement and/or tax return. Check the box to exclude estimates, sales orders, and purchase orders from closing date restrictions; these transactions do not affect the general ledger. 2. Should I start a new company file at the beginning of the year? Answer: No! I do not recommend starting a new company file unless there is data corruption and the file cannot be repaired by Intuit QuickBooks Data Services. Starting a new file is time consuming, confusing, and error prone if you have inventory, accounts receivable, and/or accounts payable. A new file will not contain your transaction history. A second company file is needed for questions regarding the prior year. Having multiple company files can cause errors if the wrong file is used for data entry. 3. What do I need to do for year end? In addition to reconciling accounts and correcting errors, there are tax forms to file and this is a good time to look at other factors that affect your accounting system. Process 1099s – Use QuickBooks to calculate and print/file your 1099s. Select Vendor menu – Print/eFile 1099s and follow prompts. Process Payroll Tax Returns Also, if you aren’t processing your payroll using QuickBooks, you are spending additional time entering data and performing bank reconciliations; consider QuickBooks Payroll options to save time and money. QuickBooks Users – At least once a year you should review your user list and delete users that are no longer with the company. 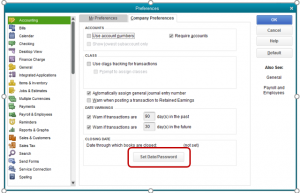 Company Preferences – Review your company preferences to insure you are getting the most out of your QuickBooks feature set. QuickBooks Desktop Version – If you are using a 2014 version, you are no longer supported by Intuit QuickBooks and you should consider upgrading. 2015 versions will not be supported after May 2018. There are many discounts and promotions; don’t assume the website or on-screen upgrade is the best price. Credit Card Processing – If you accept credit cards, consider using QuickBooks Credit Card processing. It will save you time, reduce errors, and the rates are quite competitive. Back-Up company file and verify that periodic backups are being made in a timely fashion. I hope these QuickBooks year end questions and answers help you in 2018 and beyond. Please remember you can contact me at Ilene.eisen@ie-solutions.biz if you have any questions or concerns regarding QuickBooks products, services, and procedures. Ilene Eisen, CPA.CITP, is an Accounting Expert and Software Consultant/Trainer with more than 30 years of industry experience. For more than 20 years, she has provided accounting and bookkeeping consulting services and training through her Monterey, CA-based firm, ie Solutions. QuickBooks Online vs QuickBooks Desktop: Which is Better for You?